This craft took a little bit more time, as I had to paint the background of the rock and let it dry first, before continuing with the rest of the painting. I first used a sponge to create a gradual fade on the rock from black to white/grey using acrylic paint. After this dried, I painted the black tree silhouette. I then painted flowers using yellow, gold, and red acrylic. 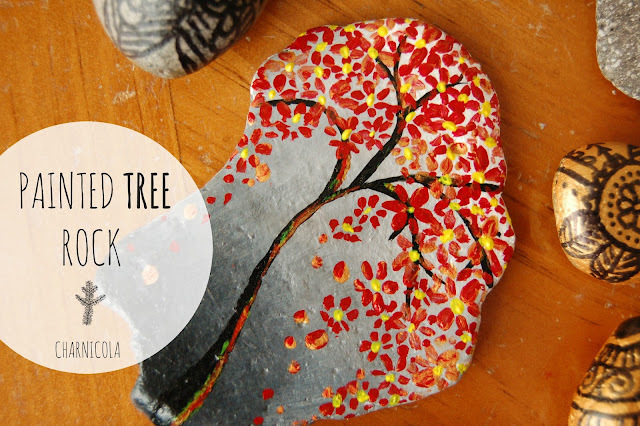 If you would like your rock to be water-proof and glossy, remember to seal with Mod Podge! !